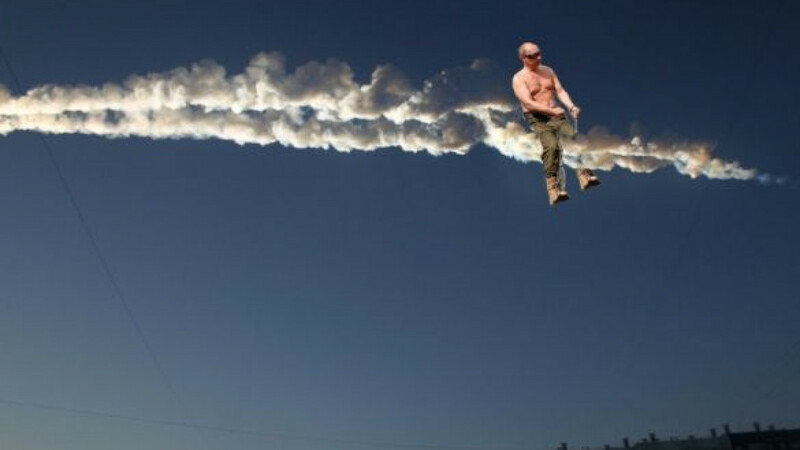 A Photoshop rendering of President Vladimir Putin riding the meteorite. The 10-ton meteor that lit up the sky over the Urals region, smashing windows and spooking locals, sent a shockwave of an entirely different kind through the Russian Internet, with numerous Net-pranksters turning the rare spectacle into an occasion for political satire and national pride. Ideas tend to spread like wildfire through Russia's vibrant, opposition-leaning Twitter and blogosphere, and Friday was no exception, with jokes, memes, phony images and conspiracy theories appearing seemingly within minutes of the first reports of the meteorite strike. They were fueled by scores of eyewitness photographs and videos, many taken from the dashboard cameras that are popular in Russia, showing smoke trails and strange balls of light above Chelyabinsk, the gritty industrial city located 1,500 kilometers east of Moscow. It was around 8 a.m. in the capital when the news started coming in to the apparent delight and amusement of netizens, some of whom started their day by posting, "Nothing makes you feel right like a morning meteorite," to Facebook walls and Twitter feeds. YouTube videos from ground zero showed the meteor's powerful shockwaves shattering windows, knocking in doors, and provoking streams of off-camera profanity foul enough to make a sailor — or a cobbler, as the Russian expression goes — turn red in the cheeks. "I'm listening to the off-camera commentary to video No. 2 and can't stop laughing," opposition leader Alexei Navalny tweeted. "Thanks to the #meteorite, the whole world will learn to curse in Russian today," wrote user @buben_i. Chelyabinsk residents have a reputation for being tough-nosed, and their reactions to the blasts evoked enough nonchalance to inspire a slew of one-liners in the spirit of "Chelyabinsk is so tough, meteorites fall instead of rain." By midday, the Urals meteor strike seemed to be on everybody's mind, grabbing headlines around the globe and shooting to the top of Twitter's world trend list. About six hours after the first reports, state-run RIA-Novosti had already published over 130 news articles on the subject. The "meteor" created at least two Twitter accounts to tell its story, and Photoshop-saavy Russians churned out, among other things, phony photographs of President Vladimir Putin riding a meteor, a reference to his enthusiasm for well-documented manly adventures. 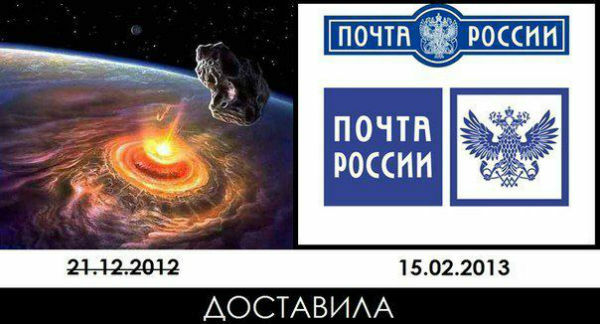 Another image poked fun at Russia's lackluster postal system, passing the meteor off as an overdue "delivery" that was supposed to arrive on Dec. 21, the date of the so-called Mayan apocalypse that came and went late last year. Others featured the popular Internet character Nyan Cat — a soaring cat trailed by a rainbow — or the furious, flying fowl from the bestselling Angry Birds app superimposed over the meteor and its tail. There were hoaxes, too: crude computer animations purporting to show space rocks detonating a parked car and squashing an entire neighborhood. Channel One quickly deleted video footage of a smoldering crater from its website after commentators discovered that it had been loaded onto YouTube in 2007. As has often been the case in recent months, the government and the Russian Orthodox Church appeared to find a common voice on Friday, with senior figures describing the meteor strike as a reminder of life's fragility. Metropolit Feofan, the Chelyabinsk region's top church official, also urged readers to thank God for not making the damage worse — about 1,000 people were injured and 3,000 buildings damaged — and to examine whether they were living piously, according to an online statement. Busy wooing foreign investors at an economic forum in the Siberian city of Krasnoyarsk, Prime Minister Dmitry Medvedev said the cosmic event was perhaps "another symbol of the forum" and "proof that not only are economies vulnerable, but so is the entire planet," Interfax reported. Conspiracy theories attributing the breathtaking natural fireworks to aliens and secret military programs stayed mainly on the fringe, where they were picked up by nationalist State Duma Deputy Vladimir Zhirinovsky, the perennial finger-wagging firebrand of Russian politics. "It's not meteorites that are falling. 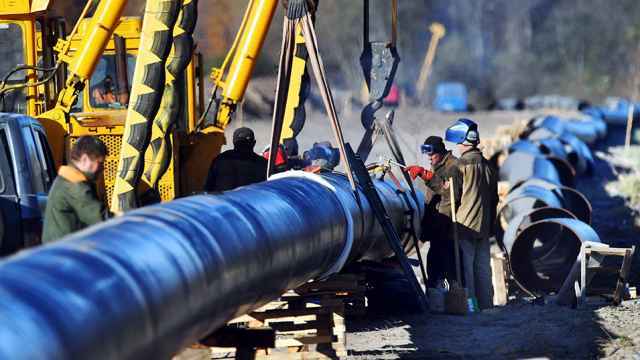 It's the Americans testing a new weapon," he said, RIA-Novosti reported. By late afternoon, when victims were just beginning to pick up the debris, including an estimated 100,000 square meters of broken glass, most tweeters, bloggers and scribblers seemed to lose interest. Those who continued following the event turned their attention to analyzing the government's reaction and to other, more earthly matters.